Worried that your car may be affected by Toyota's recent recall? Here is everything you need to know. Recalls. Such a dreaded word. We hear about them all the time. Automobiles, with their many working parts, are susceptible to faults, and now more than ever we have become aware of the seriousness of their nature. A recall occurs when a manufacturer or third party decides that a product has a fault serious enough to cause harm to consumers. It is then barred from distribution until the problem has been fixed and tested. Recently, Toyota has been involved in a number of very high-profile recalls. The largest, which, according to the National Highway Traffic Safety Administration, affects up to 4.8 million vehicles, has to do with gas pedals that becoming entrapped under a floor mat. The second recall, which involves 2.3 million vehicles -- some which were also included in the floor mat recall -- involves a mechanical issue with the gas pedal itself that can cause the mechanism to stick. Both have been deemed serious enough to warrant a recall. Another recall addresses a problem with the anti-lock braking system on 2010 Toyota Prius and Lexus HS 250h vehicles. Furthermore, an issue has arisen with four-cylinder 2010 Toyota Camrys in which the power steering hose may come in contact with the front brake tube, possibly causing a brake fluid leak. 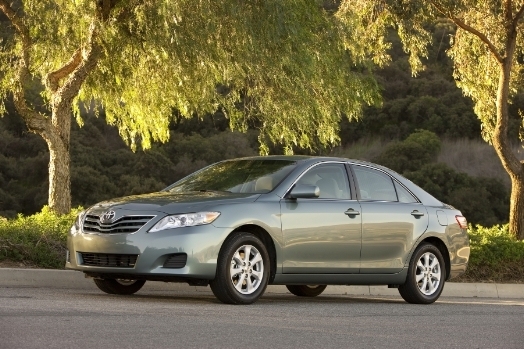 The Camry recall is completely voluntary. Customers can be informed in a variety of ways that a recall has been issued on a product they own. For vehicles, most manufacturers contact the owners directly since their information is readily on hand, though it's not a guarantee they'll be able to contact you. News outlets may also report on the recall, and many times dealerships will send notifications directly to their customers. First off, if your vehicle is listed above, don't panic. If the floormat recall affects you, remove your driver's side floormat immediately and contact your local or preferred dealer for recall insturtions. Toyotac currently has a pedal fix in place that remedies the issue. If you are affected by the sticking throttle issue, however, it is strongly recommended you contact a dealer immediately, as ignoring the issue could jeopardize your safety. If you haven't had any issues with your accelerator depressing slower or taking longer to retract, reports suggest it's unlikely you will in the immediate future. If the pedal seems to depress or retract slower than normal, do not drive your car and contact a dealer immediately. In either case, it is best to remain cautious, especially when the repairs won't cost you anything. If your accelerator does stick while driving, remain calm. Apply firm brakes and shift your car into neutral, not park. Carefully steer off the road and shut off the ignition once you have come to a stop. Don't try to switch off the ignition while still moving because doing so could lock the steering and eliminate you power steering assist. For owners whose vehicles are affected by the anti-lock brake recall, NHTSA advises you to contact your dealership immediately if you notice any change in brake pedal pressure. Also, it suggests you take caution when driving over uneven road surfaces or potholes and to allow for more braking time when stopping. In general, getting a recall notification isn’t exactly great news. However if you act promptly, you’ll be able to ensure your safety. Once you hear word of a recall for you make and model, you should contact either your dealership or the manufacturer for the quickest solution, and as long as it’s an official recall, any repairs will be free of charge. In the case of the recent Toyota recalls, Toyota is currently issuing repairs and new parts. DriverSide has a fantastic service that is free of charge. By searching for a specific vehicle year, make and model on DriverSide, you can instantly see whether or not there have been recalls on that vehicle. In addition to this, we offer a service that allows you to sign up to receive information on recalls specific to your car, so you never have to worry if that recall you heard about in the news applies to you. With all the information you need sent to you in an email, you’ll be able to act quickly to avoid potential harm to you and your family. The National Highway Traffic Safety Administration tracks all recalls and issues technical service bulletins, and is an excellent source for recall information. Visit the NHTSA website for more information on recalls. If you are a concerned Toyota owner, here is a specific link to the recall.